Reference number for this case: End-sep-54-Vaudoy-en-Brie. Thank you for including this reference number in any correspondence with me regarding this case. The C.R.S. [Compagnies Républicaines de Sécurité, a police force] also saw a luminous disc in the sky, above Vaudoy. Since the time that in all four corners of France and around the world there were flying "saucers" and other "cigars", the residents of Pau began to be vexed with the systematic disdain in which these "interplanetary visitors" held them. They had their festival yesterday. From 10 a.m. to 6 p.m., it was in the blue azure sky, a veritable carousel of luminous spots, immediately called "flying saucers". If it were necessary to gather all the testimonies of this "visiting" day, the newspaper would not suffice. We shall therefore restrain ourselves to the statements of a few persons who - they claim at least - have seen these devices distinctly. They were more favored than the multitude, thanks to binoculars they kept aimed at the sky, without fear of torticollis, part of the day. At 10 o'clock it was a milky white disk with a red bulge in its center, that carried out a rapid patrol at an altitude of some 10,000 meters. At noon the invasion began. A white, very luminous oval form appeared, preceding by half an hour four or five other discs scattered at the four corners of the sky. Around 1 o'clock, the oval object, without shame, turned to the red, then went away as it had come. It nevertheless left in the firmament enough to occupy a good part of the afternoon of the residents of Pau. Until four o'clock, with the nose in the air, the finger extended, luminous spots movind slowly and sometimes motionless for several minutes. You had to have goodwill and an excellent view to get into the game. But when you had finally spotted the object, you felt like an "initiate" in the mystery of the beyond and you were satisfied until being dazzled. Things were somewhat complicated by the fact that at the beginning of the afternoon a shopkeeper had the unfortunate idea of releasing a few child balloons. For a few moments there was a plethora of saucers in the sky of Pau. The life of the city was literally stopped. Frozen in the middle of the streets, hundreds of residents of Pau miraculously avoided crushing. And if they saw nothing, they had at least the advantage of having half an hour of excellent physical training. There were many last night who complained about aches! A truck driver who was collecting milk yesterday morning in the vicinity of Cabestany (Pyrénées-Orientales) said he saw in front of his vehicle "a shining globe of bluish color" which was evolving at an altitude of about 150 meters while producing a very soft hum." Having stopped his truck, the driver was able to observe the moves of the craft for almost a quarter of an hour and then, suddenly, it reportedly rose in the sky and disappeared in direction of the sea. A flying saucer would have been seen in Auge (Deux-Sèvres). On the other hand, M. Picaud, the manager of a brewery in Sainte-Pozenne, said he had seen for a few minutes, while traveling along the road to Fontenay-le-Comte, a curious disc of a sparkling yellow. Several inhabitants of the commune of Rebais declared to have seen a strange, very brilliant machine, circulating at night fall in the sky, above Rebais. The witnesses said that the apparatus, which was traveling very slowly, had then headed towards Coulommiers after increasing its speed, and had disappeared. The day before yesterday morning, C.R.S. also saw a luminous disc in the sky, above Vaudoy. telescope, and which ensured him as much success as the "saucers" won. Many of our fellow citizens believed and still believe that it was a launch of soundingballoons. 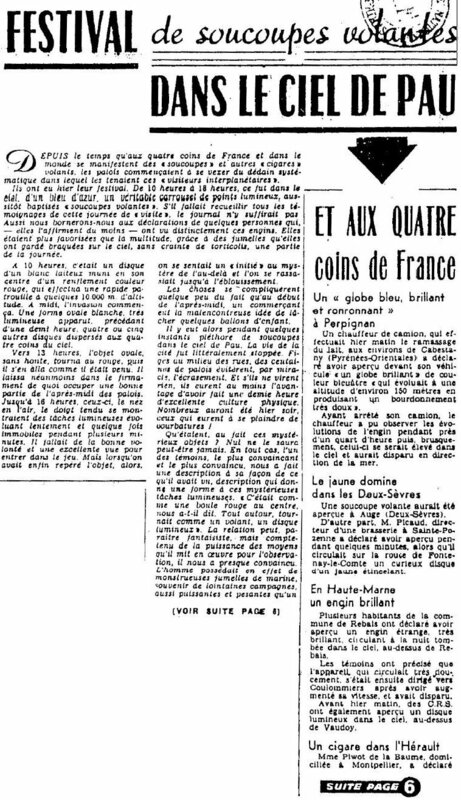 Information taken at the Center of the Weather of Pont-Long, the only one qualified for these operations, a single balloon was launched during the day, at 3 p.m.. So it was not this that was seen in the morning nor in the afternoon because, we were told at Pont-Long, such a balloon climbs quickly up to 15,000 meters and explodes. It can only be distinguished to 3,500 m.
But then, were they really flying saucers? at an altitude of about 4,500 meters, saw a cigar-shaped device, shiny, which seemed to be surrounded by a halo. The machine, which she could observe for a minute or so, suddenly disappeared in an easterly direction, without making a noise or leaving any traces. Reliable witnesses saw last night in the sky of Kounigra, a town about 130 kilometers from Casablanca, a red-shaped, circular-shaped craft evolving at a high altitude and apparently spitting flames of a blue green color. An elongated craft was seen Wednesday evening around 8:30 p.m. in the sky of Safi by credible witnesses. The "cigar" was moving at a high speed, from East to Northwest. It was surrounded by a bluish light and left behind a luminous trail. The witnesses testified that the craft was unrelated to a jet plane. Many residents of the town of Strib (Funen) claim to have seen yesterday "a yellow-reddish craft whose shape resembled a cigar operating at high altitude and leaving "tongues of fire" behind. Other luminous craft had been seen in the last three days in Funen and Sweden. Vienna. -- "Flying saucers" reported regularly for some time in Austria would be, according to the "Bild Telegraph", guided missiles used by some powers to drop anti-communist leaflets over Czechoslovakia. 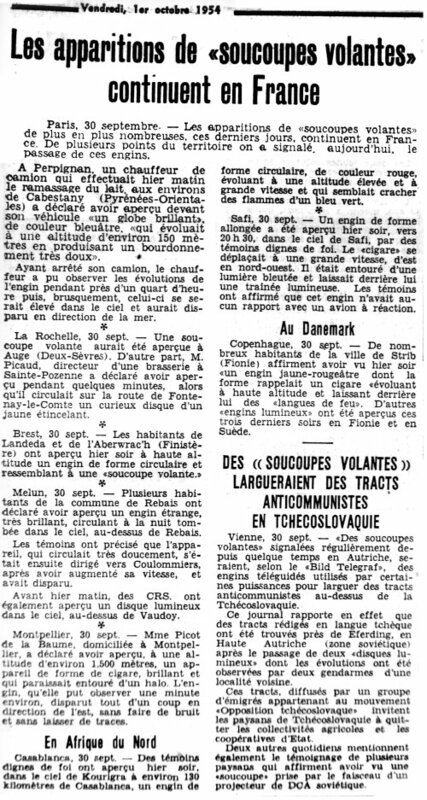 The newspaper reports that leaflets written in the Czech language were found near Eferding in Upper Austria (Soviet zone) after the passage of two "luminous discs", the maneuvers of which were observed by two gendarmes from a neighboring locality. These leaflets, distributed by a group of emigrants belonging to the "Czechoslovak opposition" movement, invite the peasants of Czechoslovakia to leave the agricultural communities and state cooperatives. Two other dailies also mention the testimony of several peasants who claim to have seen a "saucer" taken by the beam of a Soviet anti-aircraft searchlight. 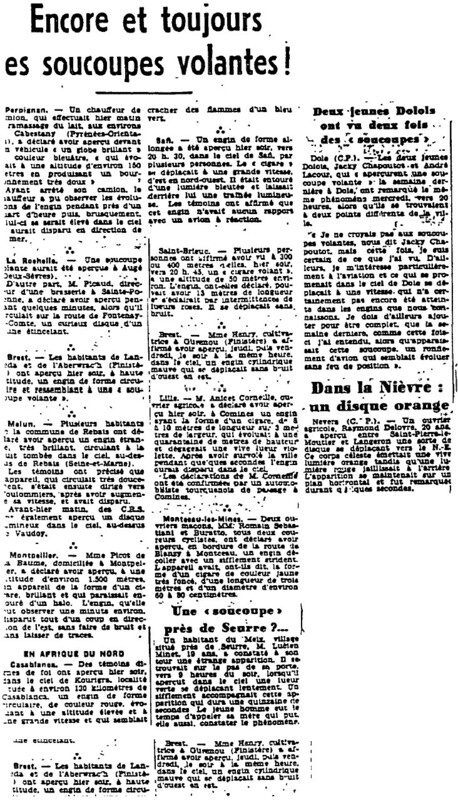 [tbr] Article in the regional newspaper La Troisième République des Pyrénées, Pau, France, pages 1, 6, 8, October 1, 1954. 1.3 Patrick Gross December 22, 2016 Additions [pr1], [ub1]. 1.4 Patrick Gross January 20, 2017 Addition [er1]. 1.5 Patrick Gross February 22, 2017 Addition [tr1]. This page was last updated on February 22, 2017.